Newcomb Spring Corp launches wire bending manufacturing services, which have the capability to bend the wire with repeatable accuracy through CNC automation. Materials from standard steels to premium exotic alloys can be transformed into any shapes ranging from round to rectangular or special section. 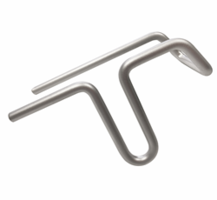 Prototype through large production runs is available using CNC wire bending services. Custom wire bending services have various applications in fields such as transportation and automotive, agriculture, retail displays, home furnishings, medical and veterinary accessories. Newcomb Spring Corp is pleased to announce the addition of custom wire bending to the company's range of manufacturing capabilities. Newcomb Spring’s new wire bending services will address the needs of companies in markets such as transportation and automotive, agriculture, retail displays, home furnishings, kitchen and bath, appliances and housewares, medical and veterinary accessories, and more. Newcomb Spring Corp is pleased to announce the addition of custom wire bending to the company's range of manufacturing capabilities. As a leader in the manufacture of custom springs, wire forms and metal stampings, Newcomb Spring has invested in CNC manufacturing technologies and advanced quality control systems for wire bending–a unique manufacturing specialty. CNC automation gives Newcomb Spring the capability to bend wire with repeatable accuracy. Materials range from standard steels to premium exotic alloys, in shapes ranging from round to rectangular, to special-section. Newcomb Spring says it will take the same collaborative approach to wire bending that the company employs in its other manufacturing operations. “We will work with customers as a strategic manufacturing partner to optimize the manufacturability, quality and performance of their wire components,” says Jacobson. Newcomb Spring has plans to continue to invest in wire bending manufacturing to address the needs of companies in markets such as transportation and automotive, agriculture, retail displays, kitchen and bath products, home furnishings, appliances and housewares, medical and veterinary accessories, and more. Customers can learn more about Newcomb Spring's wire bending services by visiting NewcombSpring.com/wirebending. Newcomb Spring Corp is a worldwide supplier of compression springs, extension springs, torsion springs, wire forms, stampings, rings, hooks, and battery contact springs. The company’s products meet demands in a variety of industries, including aerospace, agricultural, automotive, computer, medical, military, and telecommunications. Family-owned and operated, Newcomb Spring Corp is headquartered in Alpharetta, Georgia and offers additional facilities in California, Connecticut, Colorado, North Carolina, Tennessee, Texas, and Ontario, Canada. Newcomb Spring operates with ISO 9001 certified quality systems and delivers a wide range of material capabilities in the manufacture of metal components–specializing in reliability, rapid response times, and stringent quality control. Additional information is available at http://www.newcombspring.com.